In the nursery of the Darling household located in Edwardian era London, Wendy Darling tells her younger brothers John and Michael the story of Cinderella, who went to the ball and found herself surrounded by pirates. Life is disrupted when their Aunt Millicent arrives to visit. Judging Wendy to be an "almost" full-grown woman, Aunt Millicent advises Mr. and Mrs. Darling to think of Wendy's future, saying that Wendy should spend less time in the nursery, and more time with herself, to become a grown woman. The very idea frightens the children. At school, Wendy daydreams about having seen Peter in the night, and, after being caught with a drawing of him over her bed, is in trouble with the teacher, who sends a letter by a boy messenger to Wendy's father at the bank, and as she tries to stop him, along with the family's "nurse" dog Nana, embarrasses her father in front of his superiors. As a punishment, Mr. Darling chains Nana outside and declares it time for Wendy to grow up. Peter visits the nursery again looking for his shadow, which Nana had bitten off, and introduces himself. After being acquainted, Wendy sews his shadow back on and is enchanted by Peter's ability to fly and his description of Neverland and how nicely he talks about girls. She asks Peter if she can kiss him, but because he does not know what a kiss is, ends up giving him a thimble instead. He returns the "kiss" by plucking an acorn from his shirt and giving it to her. Peter invites her to tell stories to his gang of Lost Boys. She asks to bring her brothers, John and Michael, to which Peter agrees. He grabs Tinker Bell and shakes fairy dust on the children and tells them to think of happy thoughts. Nana, having escaped her chain, leads Mr. and Mrs. Darling back home from a party, but they arrive too late to stop the children. The children fly over London and then to Neverland. They observe Captain Hook's ship from a cloud. The pirates spot them and attack with their cannons. One knocks Wendy far away and the other causes Michael and John to fall towards the island below. Peter tells Tinker Bell to find Wendy while he takes care of Hook. But Tinker Bell reaches the hideout as Wendy is still falling from the sky, and out of jealousy, tricks the Lost Boys into shooting Wendy with an arrow. The boys learn the truth and confess to Peter, but Wendy is revealed not to have been killed as the arrow hit the acorn necklace hung around her neck. Angry, Peter banishes Tinker Bell and ends their friendship. When Wendy finally awakens she finds the Lost Boys on their knees begging her to be their mother, which she accepts. They blindfold her and lead her to their hideout, and she finally realises her brothers are missing. Michael and John stumble across the crocodile that ate Hook's hand, then encounter the Native American princess Tiger Lily . All three are then captured by Hook and taken to the Black Castle to use as bait for Peter Pan. Wendy and Peter visit the mermaids' lagoon to ask the dark and mysterious creatures to help in locating John and Michael, and learn that Hook has her brothers. Peter and Hook engage in a duel but it is stopped when the ticking crocodile arrives and tries to eat Hook, allowing the children to all escape. That night, after a celebration at the Native American camp, Peter shows Wendy the fairies' home and the two share a dance. Hook spies on the two and soon comes across Tinker Bell, who is still hurt and upset from being banished, and charms her into telling him more about Peter and Wendy. Peter becomes upset with Wendy after she tries to get him to express his feelings and that he will never love and never grow up, and tells her to go home and grow up if she's not happy. Wendy, hurt, leaves to be alone. Hook has the sleeping Wendy carried to his ship. There, he entices her to become a pirate, but sends a spy to follow her to the Lost Boys' underground hideout afterwards. Wendy soon comes to her senses and tells her brothers that the three of them will be going home, which upsets Peter. The Lost Boys ask if they can go too, upsetting Peter even more. Wendy tries to say goodbye to Peter but he turns away in sadness. She leaves him a cup of "medicine" and tells him not to forget to take it. Wendy leaves the hideout only to discover the pirates have been holding the boys captive outside, preparing to ambush her. Before she can scream for help, she is cleave gagged, bound and carried away by Hook's crew. Hook goes down into the tree, and puts a drop of poison in Peter's medicine. He is about to drink the medicine, but Tinker Bell intervenes and drinks the poison herself. Peter telepathically reaches out to children sleeping around the world, the Darlings, Aunt Millicent, the Lost Boys, and even the pirates to assert their belief in fairies, which brings Tinker Bell back to life. Peter and Tinker Bell save Wendy and the boys from walking the plank by making the pirates think the crocodile is on board, and a battle soon breaks out. Hook sprinkles himself with Tinker Bell's fairy dust and fights Peter in a duel while flying. Hook taunts him about Wendy abandoning him and forgetting all about him when she grows up. Weakened by those thoughts and unable to fight, Peter gives in to his inevitable death. Seeing this as goodbye, Wendy gives Peter her hidden kiss as a sign of love which gives him the strength to recover. Peter reengages Hook, who loses his confidence and falls into the waiting jaws of the crocodile. With the ship covered in fairy dust, Peter flies Wendy and the boys back to London. Mr. and Mrs. Darling are overjoyed at the return of their children, and adopt the Lost Boys. Slightly, who got lost on the way to London and arrives at the house too late, is adopted by the lonely Aunt Millicent. Peter promises never to forget Wendy and to return someday before heading back to Neverland with Tinker Bell. According to the adult Wendy, she never saw Peter again, but she continues to tell his story to her own children and grandchildren so that his legacy will last forever. Jeremy Sumpter as Peter Pan: a young boy who does not want to grow up. Unlike other versions, Peter's feelings and even his mere presence affect various aspects of the weather. Jason Isaacs as Captain Hook: the Captain of the Jolly Roger and Peter's archenemy as Peter cut off Hook's hand and fed it to a crocodile which has followed Hook ever since. In one of the few aspects faithful to stage tradition, Isaacs also portrays George Darling, the Darlings' father. Rachel Hurd-Wood as Wendy Darling: the eldest child of the Darling family and a surrogate mother to the Lost Boys and her younger brothers, John and Michael. Saffron Burrows plays the adult Wendy, who narrates the film. Burrows appears in the deleted epilogue. Lynn Redgrave as Aunt Millicent: the maternal aunt of the three Darling children. Aunt Millicent is an original character created for the film. Richard Briers as Mr. Smee: Hook's humorous first-mate. Olivia Williams as Mrs. Mary Darling: the matriarch of the Darling family. Harry Newell as John Darling: the middle child of the Darling family. Freddie Popplewell as Michael Darling: the youngest child of the Darling family. Ludivine Sagnier as Tinker Bell: Peter's fairy companion who is jealous of Wendy. Rebel as Nana: the dog nurse of the Darling family. Carsen Gray as Tiger Lily: the daughter of a Native American chief. Kerry Walker as Miss Fulsom: a strict schoolteacher. Mathew Waters as the Messenger Boy. Patrick Gooch and Lachlan Gooch as twins. After the script was written, Stephen Cox, Chief Press Officer for Great Ormond Street Hospital for Children NHS Trust, gave the hospital's approval, saying, "We have read the script by P. J. Hogan and Michael Goldenberg and are delighted to report that we feel that it is in keeping with the original work whilst communicating to an audience with modern sensibilities." The visual effects in the film are a mixture of practical and digital. The fairies that appear in the film are actors composited into the film with some digital enhancements. According to actor Jason Isaacs, the filmmakers were impressed with actress Ludivine Sagnier's performance and decided to abandon their plans to make Tinker Bell entirely computer animated. The film also features a large, computer-generated crocodile. Another character, an animatronic parrot, appears in some scenes on the pirate ship. A complex harness was built to send the live-action actors rotating and gliding through the air for the flight sequences. They were then composited into the shots of London and Never Land, although they are sometimes replaced with computer-generated figures. One other aspect of bringing the story to life was the complex sword-fighting sequences, for which the actors were trained. Sumpter said that, "I had to train for five months before the shoot. I had to do harness training to learn how to fly and learn how to swordfight," and that, "I got stabbed a couple of times with a sword." Hogan says that the flying scenes were very difficult to accomplish, but that, "it was tougher on the kids than it was for me. They were up there on the harness 12' off the ground, having to make it look like flying is easy and fun." Sumpter grew several inches over the course of the film's production, requiring staging tricks to retain Hook's height advantage over Peter in face-to-face scenes late in the process. Hollywood-based producer Lucy Fisher also said that, "The window he flies out of had to be enlarged twice." The film is dedicated to Dodi Al-Fayed, who was executive producer of the 1991 film Hook. Al-Fayed planned to produce a live action version of Peter Pan, and shared his ideas with Princess Diana (who was President of Great Ormond St Hospital), who said she "could not wait to see the production once it was underway." Al-Fayed's father, Mohammed Al-Fayed, co-produced the 2003 adaptation of the tale after his son died in the car crash which also killed Princess Diana. Finding Neverland, a film about J. M. Barrie and the creation of Peter Pan, was originally scheduled to be released in 2003, but the producers of this film – who held the screen rights to the story – refused permission for that film to use scenes from the play unless its release was delayed until the following year. Filming, which lasted about twelve months and ended in June 2003, took place entirely inside sound stages on Australia's Gold Coast, Queensland. According to Fisher, the decision to shoot in Australia was based on the low value of the Australian dollar at that time. Hogan had originally planned on filming in a variety of locations such as Tahiti, New Zealand, and London but abandoned this idea after scouting some of the locations. Filming on sound stages did help "retain some of the theatricality of the original play", something which Hogan thought was important. Universal distributed in France and in all countries where English was the primary language (including the US and Canada), while Columbia released the film in the rest of the world. Worldwide digital and television rights are held by Sony/Revolution. As a result, the film is distributed on digital and television platforms by Debmar-Mercury and 20th Television. An alternate, extended ending based on Barrie's epilogue is featured on the DVD, but with unfinished special effects and no music. In this version, Peter returns to the London house years later, finding an adult Wendy. He is deeply hurt when she tells him she has grown up, and walks over to her own daughter, asleep in bed. His sobbing awakes the little girl, and she introduces herself as Jane. Peter grins excitedly at Wendy, and with her mother's permission, Jane flies away with Peter to Neverland as Wendy watches them through the window. For the promotion of the film, the original novel of Peter Pan by J.M. Barrie was released with the cover that was the same look as the teaser poster. A video game was also released only for the Game Boy Advance on 4 November 2003. In it players can fly, fight, and solve various puzzles and collect special objects for special prizes and bonus points. The game received mixed reviews overall with Gamezone giving it a 6.4/10, Cubed3 giving it a 5.2/10, and Nintendo Power giving it a 2.2/5. Cubed3 criticised the game for the bad dialogue and repetitive and rushed gameplay, but praising the graphics and sound. This film was released in theatres on 22 November 2003 in Australia, on 24 December 2003 in the United Kingdom and on 25 December 2003 in the United States of America and Canada. The film was released on VHS and DVD on 4 May 2004. This film had airs on Encore Starz on Demand with Babe: Pig in the City, Casper, The Borrowers and The Little Rascals since March 2004 and on HDNet Movies since July 2005.
Review aggregator Rotten Tomatoes gives the film a score of 77% based on 144 reviews, and an average rating of 6.8/10. The website's critical consensus reads, "Solid if far from definitive, this version of Peter Pan is visually impressive, psychologically complex and faithful to its original source." On Metacritic, the film has a weighted average score of 64 out of 100, based on 33 critics, indicating "generally favorable reviews". Film critic Roger Ebert gave the film three and a half out of four stars. MovieGuide has also favourably reviewed the film, calling it "a wonderfully crafted, morally uplifting movie that intentionally emphasizes the fantasy elements of the story both in dialogue and design of the film." Peter Pan earned $48,462,608 at the box office in the United States and another $73.5 million outside the US, which brings the worldwide total to nearly $122 million. It faced competition from the highly anticipated The Lord of the Rings: The Return of the King released the week before, and Cheaper by the Dozen, which opened on the same day. ^ a b "Peter Pan (2003): Full Production Credits". The New York Times. Retrieved 29 March 2012. ^ "Peter Pan (PG)". British Board of Film Classification. 9 December 2003. Retrieved 16 November 2016. ^ a b "'Gigli's' Real Price Tag – Or, How Studios Lie About Budgets". The Wrap. 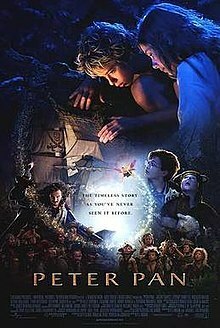 ^ a b c "Peter Pan (2003)". Box Office Mojo. Retrieved 1 September 2009. ^ ""Peter Pan" Soars Again". About.com. 24 June 2002. Retrieved 4 January 2009. ^ a b Wloszczyna, Susan (7 August 2003). "A Mature Peter Pan". USA Today. Retrieved 10 September 2008. ^ Murray, Rebecca. "Interview with 'Peter Pan' Star, Jeremy Sumpter". about.com. Archived from the original on 29 September 2008. Retrieved 16 September 2008. ^ Murray, Rebecca. "Director PJ Hogan Discovers Neverland With 'Peter Pan'". about.com. Archived from the original on 11 June 2008. Retrieved 16 September 2008. ^ "Dodi Al-Fayed – Peter Pan". Archived from the original on 20 June 2011. The first step was for Dodi to negotiate an extension of the rights granted by the hospital to his father. He was in the process of doing that when he was killed. ^ a b Mitchell, Peter (23 December 2003). "Dark days loom for Aussie film industry". The Age. Australia: The Age Company Ltd. Retrieved 11 September 2008. ^ Ramshaw, Mark. "Peter Pan: Hook, Line and Tinker". VFXWorld. AWN, Inc. Retrieved 15 January 2004. ^ "Peter Pan (2003)". Rotten Tomatoes. Fandango Media. Retrieved 12 March 2018. ^ "Peter Pan Reviews". Metacritic. CBS Interactive. Retrieved 11 March 2018. ^ Ebert, Roger (24 December 2003). "Peter Pan Review". Chicago Sun-Times. Archived from the original on 11 October 2012. Retrieved 25 May 2014. ^ "PETER PAN | Movieguide | Movie Reviews for Christians". Movieguide | The Family & Christian Guide to Movie Reviews. 17 August 2012. Retrieved 29 June 2017.